After previewing Frye's Spring 2010 collection on Tuesday, I walked about 20 blocks (it was a shame to waist a picture perfect Indian Summer day) to preview collections from Wunderlich Inc and P3R - the former is a new, New York-based firm founded by my fellow Divas Who Dine gal Gwen Wunderlich and the latter is an LA-based firm. Sometimes editors go to appointments because they want to support their friends and don't care what is showing. That's pretty much why I came to this preview. But, I did find many goodies that I'll be using for stories on BagTrends.com, as well as my work for TV, AOL's StyleList.com, and Twolia. Although I'm not into t-shirts, let alone one's with text and images, numerous styles from Kid Dangerous' assortment brought a gitty smile to my face. "I Heart Bay Side" with the heart being the face of Zack Morris aka Marc Paul Gossling is a must buy. On the accessories front, Charmed Circle had unique items including a caged heart that opens to hold gem stones and an envelope charm that open to reveal an engraved note you can personalise. 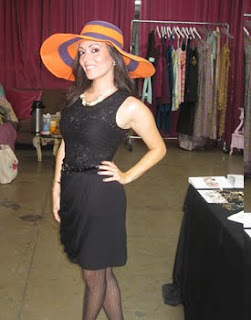 I also enjoyed playing around with hats from D&Y, all of which retail under $40 and have a very loyal celeb following. As for bags, spring's assortment from Anavaa Kisasa (which presented at the recent BagTrends NYC Arm Candy Party) had a very Wonder Woman feel and I think I'm going to start a new bag relationship with Madison Kelly NYC. 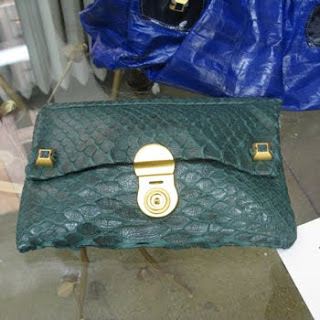 The big, python shoulder bag I'm demonstrating in the picture below will give your girlfriends something to talk about. This appointment lasted about an hour, mostly because I was delighted to catch up with P3R's Raphie C. whom I haven't seen since our days at InStyle. She was always the cool girl I looked up to - smart, with a sharp tongue and very good at what she did. I can't wait to visit her this week in Los Angeles. I'll be sure to wear my Kid Dangerous t-shirt (just as soon as I buy one) with a faux-fur vest over it, a Lena Erziak handbag, JustOne leggings and my Christian Louboutin pewter peeptoe pumps. I think that's very LA, no? 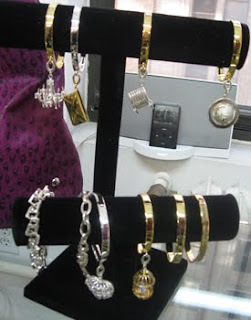 It was a non-stop day of spring 2010 preview appointments. I kicked off the morning with a Frye presentation. I’m not really a rugged, leather boots and saddle bag kind of gal, but Frye isn’t just that any more. Their offerings have expanded without losing site of their worn leather and hand detailed pieces. The Weave Magazine Shoulder Bag in violet with a woven lanyard-like rope handle, really caught my eye ($368). This shape is part of the assortment of huaraches. At the presentation, it was nice catching up with the ladies from the Bromley Group, which reps Frye. Karen Bromley is always a delight to see and her tribal-cool necklace was having its own fashion moment – just wish I took a picture to share with you. In my past life, I used to intern for the Bromley Group and despite my abrupt departure (long story – nothing too dramatic) I’ve kept in touch with Karen. Before departing, I was gifted a leather-bound Frye notebook. You really can’t give a writer anything better! After departing the Coca-Cola building on 55th and 5th, I walked to the P3R press preview on 37th and 7th and then cabbed it to Rebecca Minkoff’s spring 2010 line. 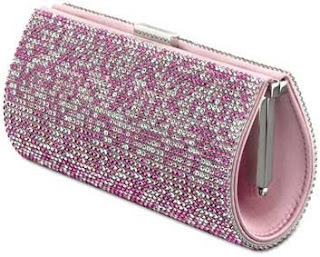 In honor of Breast Cancer Awareness Month, Swarovski has re-colored it's Power Bag in pink. The original version of this evening clutch has been a red carpet staple, carried by Hillary Swank, Carmen Electra, Dita Von Teese and Emmy Rossum. The Pink Power Bag went on sale on both on http://www.swarovski.com/ and at Swarovski boutiques nationwide October 1st. It retails for $850 and ten percent of the proceeds will go to The Libby Ross Foundation’s Yoga Program For Breast Cancer Survivors. 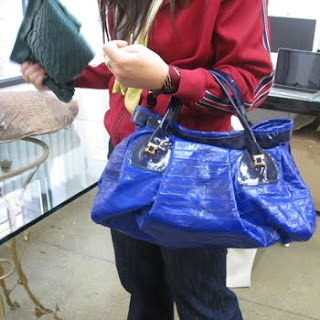 Have you ever seen a great handbag and thought, "Oh, if it only it had a longer shoulder strap and an outer pocket with a zipper, it would be perfect"? If so, this ALDO contest is for you. ALDO invites you to personalize a pair of their shoes, boots or a bag with studs, straps, accessories, or any other creative element. Post a picture of your creation online at www.aldoshoes.com/diy where a panel of judges from both ALDO and TEEN VOGUE (the co-sponsor) will choose 10 Finalists. The public will then chose a winner who will get to collaborate with the designers at ALDO to create a shoe or bag for the Fall/Winter 2010 collection. To make it even more bag-a-licious and shoegasmic, the winners item will be promoted in Teen Vogue's Spring 2010 issue. OK, now to the fine print: submissions close ct 16 and the finalists are chosen Oct 20. The contest is open to all legal residents of Canada , the 48 contiguous United States, Alaska , Hawaii , the District of Columbia and the United Kingdom who have reached the age of majority in the territory in which they reside. Visit Aldoshoes.com/diy for all the details. So, remind me again, why are you still online when you should be cutting, crafting and creating magic? PS Feel free to share you designs and progress with me! I'd love to see what you come up with. It's that time again. Time to gather the girlfriends for a night of bag-a-licious fun at the fall 2009 BagTrends Arm Candy Party. We invite you to relax as you get pampered with hand massages and mini facials courtesy of Lierac, receive complimentary hair analysis from Phyto, drink Voga wine .... but most of all SHOP SHOP SHOP. The list of Arm Candy delights at this party is beyond words ... but I'll try.